While for many, evaporative cool cells have already been set-up and turned on due to the recent heat in the Upper Midwest, it never hurts to go over the basics on evaporative cool cells to help make good management decisions and have successful summer operation. To start, as incoming air moves across the wetted pad media, the water evaporates. When the water evaporates and changes phase from a liquid to a vapor, it requires energy. That energy is drawn from the water itself and the incoming air, and as a result, the temperature of the air decreases. Consequently, the amount of moisture in the air increases, too. For example, assuming a 75% efficient cool pad (which is fairly common), air at 90 F, 20% relative humidity can be cooled to about 67 F, 75% RH. While air at 90 F, 60% RH can only be cooled to 81 F, 90% RH. The air exiting the cool cell is cooler but with more moisture, and this can be important for how well it cools pigs. Effect of dew point temperature (tdp) on cool cell exit temperature (75% efficient). Impact of dew point temperature on cool cell exit temperature. 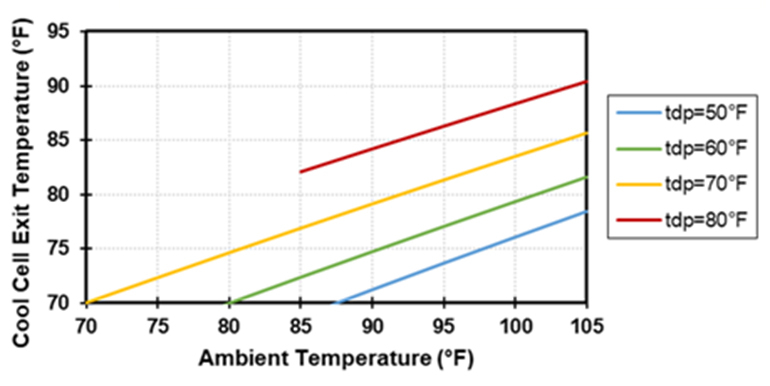 Note for example, when dew point equals 70 F and ambient temperature equals 70 F, the air is completely saturated; hence, no cooling is possible, and cool cell exit temperature is the same as ambient temperature. While the cooler air is beneficial to the pigs, the increase in moisture can be problematic. For cooling to occur, a temperature gradient must exist; hence, as the air temperature approaches the skin temperature of the pig (which is roughly 90 F in warm/hot conditions), very little to no heat can be removed (regardless of airspeed). During these times, the main way swine lose heat is through evaporation, either by panting or from evaporation after wetting the skin. When there is a temperature difference, additional airspeed increases heat removal, but limited benefit when airspeed exceeds about 400 feet per minute. With an evaporative cooler the air temperature is cooler but with more moisture. The increased airspeed of the cooler air can remove more heat (think wind-chill), however, taking air through the evaporative pad at a higher speed can result in lower efficiency. In general, the rule of thumb for sizing a 6-inch pad is 1 square foot for every 400 cfm. We have to make sure the pig is losing enough heat to this larger temperature gradient and does not need to use additional physiological responses that require evaporation (e.g., respiration) because that cool and moist air may not have the capacity to hold more water vapor. The key is to not under size fans just because the air is cooler. Also, not enough fan capacity still leads to heat accumulation in the room, even if the air temperature is cooler. One of the most important aspects of how well a cool cell will work is local climate. The temperature and relative humidity of the incoming air dictates the available cooling potential. Hot and dry climates, such as in Arizona, have a large cooling potential compared to hot and humid climates, such as in North Carolina. Here in Iowa, we tend to fall in between, and have a variety of hot/humid and hot/dry days. It is important to seek out the design conditions to determine the evaporative cooling potential. Other important aspects for efficient cooling are the evaporative pad thickness, face air velocity and the overall pad cleanliness/wetted area. As the thickness of the pad increases, cooling efficiency increases. There is a 24% difference in cooling efficiency between a 6-inch (~72%) and 24-inch (~96%) thick pad. Why not just use a 24-inch thick pad? Because at a constant air velocity, the pressure drop is considerably higher, resulting in reduced fan capacity and higher electricity usage. Often, cool cells tend be neglected, so ensure the media is cleaned and replaced when it is damaged or had rodent holes. Old pad media can substantially reduce airflow, increase pressure drop and decrease efficiency. Streaking is a good indication of poor water distribution and pressure should be checked as well as potential clogs in the nozzles above the pad. In addition, check pump screens and filters to ensure good water flow to the pad. Regular scheduled maintenance is important for maintaining good cooling efficiency. Some weekly recommendations include flushing the inline strainer, clean return water filter screen, check for dry streaks and debris on pad material. Some monthly recommendations include cleaning the foot valve, control sensor, panel distribution pipe holes, drain and clean sump tank, and clean/check float valve.